Ever since I decided to eat a little healthier, breakfast is quickly becoming my favourite meal of the day. And, with the ever growing phenomenon of brunch, scrambled eggs are becoming more and more popular! Here’s a recipe that I’ve created (yep, I made it up) for those days when you have the time to make something a little fancy! Ok, this sounds like a lot of ingredients, but this is a super simple recipe, trust me! Plus, it means that you can have 3 of your 5 a day at breakfast! Beat 2 eggs together using a fork. Add 100ml of milk, and pour into a pre-oiled, pre-heated frying pan over a medium heat. Peel avocado, remove the seed and mash using a fork until smooth. Using a spatula, carefully scramble the eggs in the pan. Add 2 tsp soy sauce to the spinach and kale, and combine the ingredients of the two pans. Keep cooking until most of the moisture from the egg has gone. Stick your bread in the toaster. Once the moisture has gone, take your egg mixture off of the heat and add the tbsp of Philadelphia. Once your toast has popped up, time to load it! I like to add the avocado first, spreading this onto the dry toast. I then add the egg mixture on top! Let me know if you give/are going to give this recipe a go in the comments! OMG, this looks sooooo yummy! 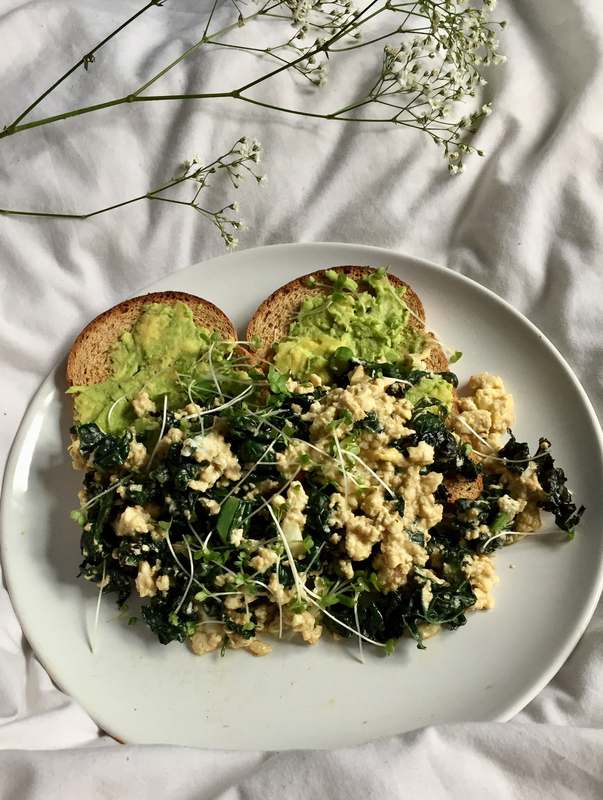 Kale is meant to be so so good for you but the texture just isn’t my favourite, but in a recipe like this it looks really tasty, so I’ll definitely have to try it out! my breakfasts have been quite boring lately, so I need to jazz them up! Previous Post What It's REALLY Like To Study An English Degree!